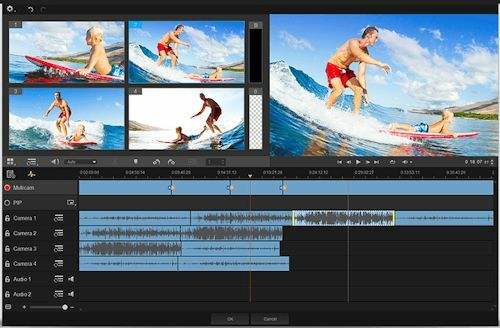 September kicks off the traditional season for the annual release of new consumer video editing software, and this year is no exception. First out of the gate is the new CyberLink PowerDirector 14. CyberLink's approach is to provide entry-level versions of its software starting at $59, but then scaling up to a full pro-level digital media suite, Director Suite 4, for $299 -- including video, audio, photo, and even color correction tools, plus additional content. The flagship PowerDirector 14 provides 100-track editing of 2K and 4K video, with sophisticated features including title effects and motion blur, motion tracking, and stabilization. The major new additions include an Easy Editor mode for more novice users, plus impressive motion tracking of multiple selected objects in a clip. But the most interesting addition is a dedicated Action Cam Center, with a panel of tools to clean up and enhance these difficult high-motion videos. These include corrections for shaky video (stabilize on all axes plus rotation), fish-eye distortion (with presets for GoPro & other lines), and color shifts (presets for blue water, white snow, and green fields). The Action Cam Center also makes it easy to apply common enhancements including slow mo, freeze and zoom, and repeat and replay. Sweet! - PhotoDirector 7 combines photo management and editing and adjustment tools including object removal and photo merging. - AudioDirector 6 adds multi-track mixing and round-trip editing with PowerDirector videos, with features including restoration adjustment tools, frequency spectrum editing, and a vocal transformer. New features include automated dialog alignment and replacement for voice-overs and beats per minute editing (like sheet music). - ColorDirector 4 adds pro-style color correction and grading to the suite, including built-in film-style presets, color tinting and replacement, split toning colors and highlights, and high dynamic range enhancement -- supported by motion-tracked masking. CyberLink sells the individual tools in multiple versions and bundled in suites. The base PowerDirector 14 Deluxe is $69, the Ultra version for $99 adds 4K editing and associated pro formats and the Action Cam Center, and the Ultimate version for $129 then piles on additional content and effects packages from NewBlue and proDAD. The PowerDirector 14 Ultimate Suite for $249 adds AudioDirector and ColorDirector, and the full-up Director Suite 4 with PhotoDirector tops out at $299. The Suite also is available in a yearly subscription version for $100. CyberLink continues to enhance its impressive connection of media editing tools and technology. It's a great choice for enthusiasts to pros who want to work in dedicated applications. You can check the software out by downloading the free 30-day working trial versions. Adobe Premiere Elements 14 is another entry from the autumn collection of new releases of video editing tools (see previous post on CyberLink PowerDirector 14). Adobe offers Premiere Elements bundled with the Photoshop Elements photo editor together for $149, or each separately for $99 -- on either Mac or Windows. These also include a separate Organizer tool to import, tag, and review all your media assets. 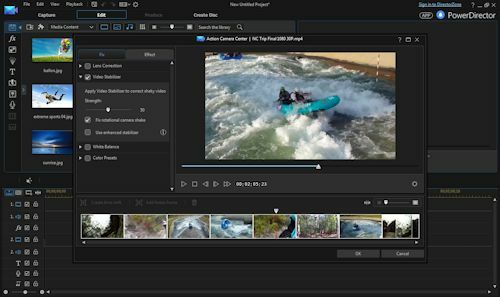 Adobe's approach to consumer-level video editing is focused on using technology to analyze your media in order to assist the editing process, not only in the editing process, but also in organizing your collections of media assets. The big technology step in Premiere Elements 14 is full support for working with higher-res 4K video. It also adds motion titles so you can animate overlay text and graphics, assisted by built-in presets. The Elements tools also include Guided Edits that step you through the process of performing commonly-desired but non-obvious operations. New such Guided Edits in Premere Elements include slow- and fast-motion effects, as well as color pop to highlight selected elements and deemphasize the rest of the scene into black and white. Premere Elements also adds assistance during export, to recommend the best export settings for your movie. The coolest technology addition in Photoshop Elements is automated edge selection for fine details like hair and fur -- you only need to paint loosely over the edge region. It also adds shake removal to un-do blurring from an unsteady camera (think selfies), and haze removal for sharpening backgrounds in landscape shots. Photoshop Elements now has 34 Guided Edits, including new assists for adding movement to action shots and resizing to fit a specific need. It also enhances the Quick Edit mode for quick fixes, and automatically recommends the five effects that should be most useful for each specific photo. The Elements Organizer continues to add automated analysis to help you organize and categorize your media files, with enhanced support for finding content by people, places, and events. When looking for specific people, the face recognition is designed to identify individuals from childhood into later years. For finding media by places, Elements includes a zoomable map to group your photos and video based on where you shot them (if captured on a smartphone or camera with GPS). And Elements can group files shot at similar times and places so you can associate them with specific events. The Elements approach provides a tremendous assist for organized people who can really leverage these tremendous automated assists. See for yourself by downloading the free 30-day trial version. Now owned by Corel, Pinnacle Studio is another long-standing name in video editing (as you can tell from the version number). It's an all-in-one tool, available in three editions -- designed to be easy for beginners but also upgrade to professional power and features. The new version 19 adds pro features including project bins to organize your files, a Favorites tab, multi-cam editing, automatic audio ducking, and support for additional camera formats. The multi-cam editing allows you to screen footage, automatically align clips with audio syncing, switch angles, cut and delete footage, add transitions, and then save the result to the timeline for further editing. The base Pinnacle Studio 19 for $59 provides 6 tracks for HD editing, 1500+ effects, transitions and templates, and easy DVD authoring with Pinnacle MyDVD (Blue-ray is a separate plug-in). Version 19 also adds multi-cam editing for 2 cameras. Pinnacle Studio 19 Plus for $99 steps up to 24-track editing, 1800+ effects, and 4-camera multi-cam. It also supports 3-D video and Dolby 5.1 audio editing, and more advanced features like keyframe effects. Plus also adds the enhanced screen capture and new audio ducking to lower the ambient background sound for clearer narration and dialog. The full Pinnacle Studio 19 Ultimate for $129 ($85 street) piles on more power, with unlimited tracks to edit up to 4K Ultra HD video, 2000+ effects with new effects from NewBlue, and 6-camera multi-cam. Ultimate also adds new support for XAVC and DVCPRO HD decoding, and VBR (variable frame rate) video from the iPhone 6 and other cameras. Pinnacle Studio continues as a powerful all-in-one video editing tool, scaling from consumer to more professional use. Unfortunately, there's still no trial download, although you can download manuals for version 18 to review. SnapPower has a very clever and ridiculously simple approach to turn an electrical outlet into a handy night light or USB charger. You don't need to mess around with the power, or replace and rewire the entire outlet. Instead, you just replace the outlet cover plate. The SnapPower cover plates have prongs on each side that snap into place on each side of the outlet and draw power from the outlet screws. There's no fuss, and the electrical outlets are still free for use. 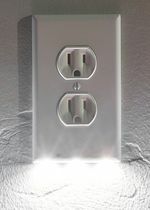 The SnapPower Guidelight turns your outlet cover plate into a night light. It uses two LED lights that draw minimal power and should last 25++ years. And it has a sensor that turns the lights off during the day. The Guidelight is available for around $15 each, and in multi-packs, including $120 for a pack of 10. The new SnapPower Charger turns your outlet cover plate into a USB charger. It provides 1 Amp, comparable to the Apple iPhone 6 chargers. It's rated to charge smartphones in 2 hours, and larger tablets and other 2.1 devices more slowly (iPad Air 2 in 7.5 hours). The Charger is available for around $20 each, and in multi-packs, including $160 for a pack of 10. These are available to match your decor in white, light almond, and ivory, and in Duplex (traditional 2-up rounded) and Decor (rectangular) designs. Both SnapPower products were (very) successfully funded on Kickstarter, with the SnapPower Charger recently becoming available for purchase. Entries posted to Manifest Tech Blog in October 2015, listed from oldest to newest.